A droll seaside idyll, paying tribute as much to film comedies of the silent era as to the 1953 movie that inspired it. 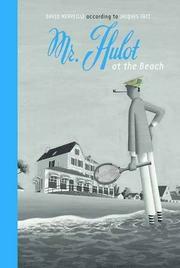 In wordless, monochrome, mostly full-page illustrations, Merveille considerably reworks and abbreviates the plot of Les Vacances de M. Hulot but preserves both the pipe-smoking title character’s amiable imperturbability and the original’s nonstop succession of sandy distractions, minor disasters, and comical set pieces. A positive magnet for mishaps, hardly does Hulot stroll onto the beach before he’s doing classic battle with a folding lounge chair. There follows business with beach balls and children, a sea gull who steals his shoe, some funny improv with a seashell after he drops his pipe in the water, and other incidents. Finally, he falls asleep on the aforementioned chair and floats out to sea—fetching up in an English hamlet where he is last seen offering his by-now-tattered newspaper (its palest yellow the only spot of color in the art) to an astonished resident. Practically every picture is either a punch line or an obvious setup for one, but even young audiences unexposed as yet to the Chaplins and Keatons of yore will have no trouble either connecting the dots or appreciating the visual jokery.